First published in 1988, this books argues with received accounts to reclaim Brecht’s emphasis on his self-described ‘dialectical theatre’, re-examining firstly the concepts of Gestus and Verfremdung and their realisation in Brecht’s poetry in terms of his attempt to consciously apply the methods of dialectical materialism to art and cultural practice. 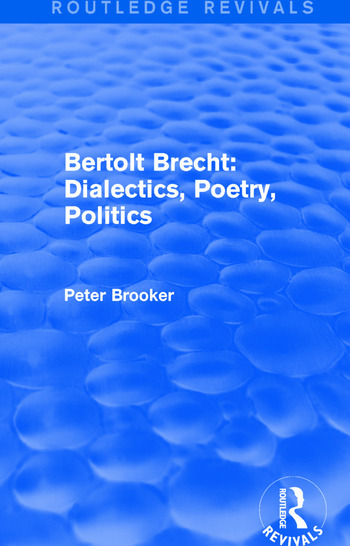 The author also takes issue with the customary view of Brecht’s career and politics which sees him as compromising either with Communist party dogma or bourgeois aesthetics, to find developing parallels between Brecht’s political and artistic though and the critical dialectics of Marx, Lenin and Mao. This development is examined in later chapters in relation to the early and late plays, The Measures Taken and Days of the Commune as well as in relation to Brecht’s changed circumstances in the years of war-time exile and in post-war East Germany.